Do I remember a late Friday night, early Saturday morning, circa 1981, when a young man and myself fenced our way up the hill at Rosalie, fallen palm fronds for our epees, silliness our favourite feeling as we danced through the night? Why, yes, I do, and I sometimes wonder where that young man ended up, apart from decades older. Well, actually, I know, and I also know that we’ll always have that Friday-Saturday in Rosalie, and I certainly hope the palm fronds recovered well. Touche, Michael. This entry was posted in F-Olympic Games 2016, Special Occasions and tagged carpenter, cartoon, cheer squad, chicken, comic, fencers, lego, minifigures, Olympics, Rio 2016, Rosalie, saw on August 19, 2016 by Jay Verney. 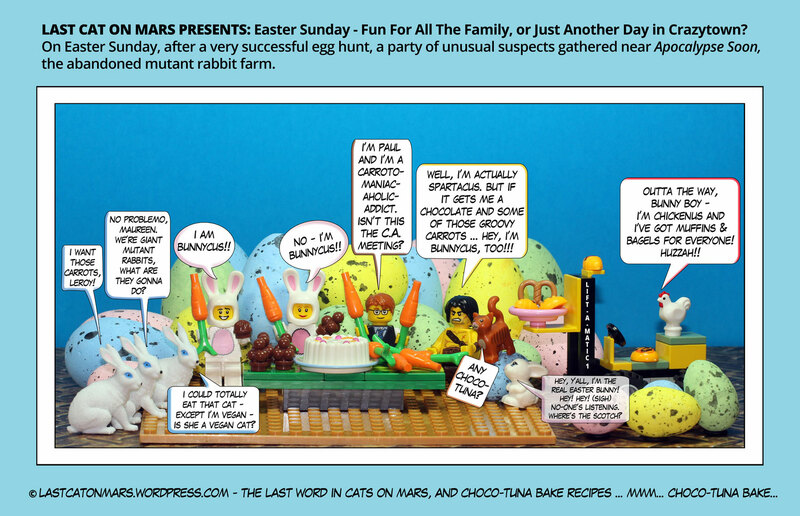 Last Cat On Mars Presents: Easter Sunday – Fun For All The Family, or Just Another Day in Crazytown? It could be the chocolate fondue fountain, it could be the incessant grating of carrots, it could be the groans from Apocalypse Soon, or it could be that Dr On Mars has been watching far too many ancient Greco-Roman-Kebab-a-rama-BBQ-tuna-esque tall tales beamed in by satellite from the back of a semi-trailer three-point-five kilometres south of Broken Hill. Just sayin’. Soooo, anyway, enjoy your Easter Sunday, friends, and all the hot cross bunnies you can eat, or kiss better – they’re crabby little buggers, aren’t they? 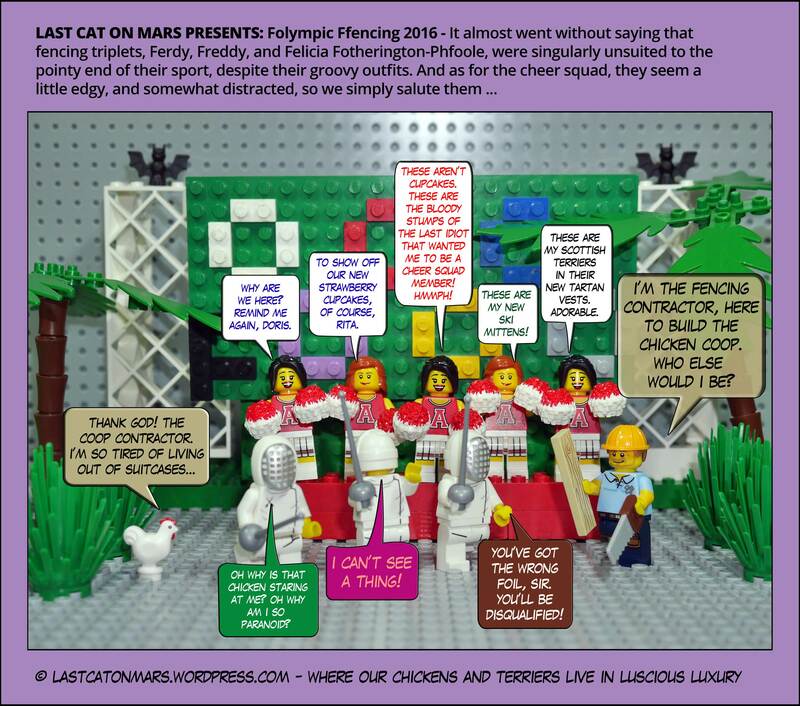 This entry was posted in Special Occasions, Variety Show and tagged bunnies, Bunnycus, carrots, chicken, comic, Easter, Easter eggs, Easter Sunday, eggs, food, Last Cat, lego, minifigures, rabbits, Spartacus on March 27, 2016 by Jay Verney. 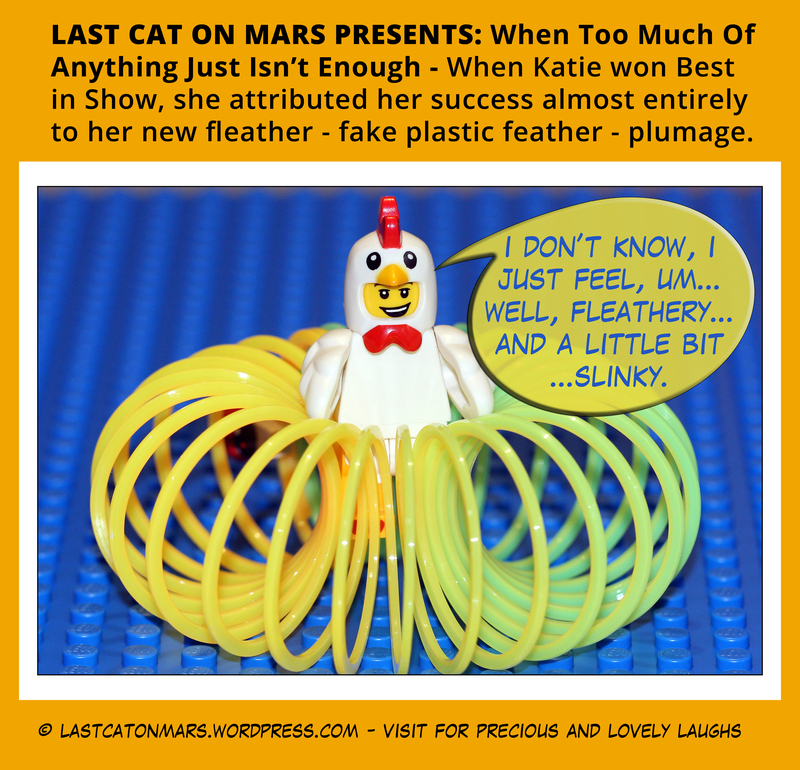 This entry was posted in Variety Show and tagged chicken, feathers, fleather, lego, minifigure on January 16, 2015 by Jay Verney.